The Carb-Sane Asylum: Is Gary Taubes Trying To Rescue His Legacy? Is Gary Taubes Trying To Rescue His Legacy? It seems to me that enough folks, including Kevin Hall PhD himself, have weighed in on the specifics of his recent LC ≠ more [body] fat burning smack down metabolic ward study that I didn't have the need to. I do, however, have a bit of a retrospective look at things in the works. But Gary Taubes has seen fit to respond in the New York Times, in most ridiculous fashion: Diet Advice that Ignores Hunger. First of all, Gary Taubes is no young whippersnapper, in fact he's a bit older than me. I remind folks of this not to pick on his age, but to put some context to how ridiculous this notion that hunger on extreme diets has been ignored. Does he not recall the widespread use of amphetamines and their OTC counterparts in the form of Dexatrim and such? Seriously ... diet pills to curb hunger have always been around, they've just fallen a bit out of favor due to the inefficacy of most. If you really want a flashback laugh, go take a gander at this post: Gary Taubes' Diet Doctor. **Seriously funny stuff there** Screenshot of current URL. TOWARD the end of the Second World War, researchers at the University of Minnesota began a legendary experiment on the psychology and physiology of human starvation — and, thus, on hunger. The subjects were 36 conscientious objectors, some lean, some not. For 24 weeks, these men were semi-starved, fed not quite 1,600 calories a day of foods chosen to represent the fare of European famine areas: “whole-wheat bread, potatoes, cereals and considerable amounts of turnips and cabbage” with “token amounts” of meat and dairy. 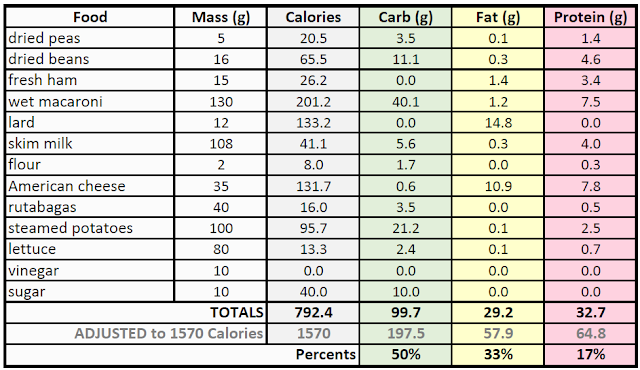 As diets go, it was what nutritionists today would consider a low-calorie, and very low-fat diet, with only 17 percent of calories coming from fat. HOLD UP!! 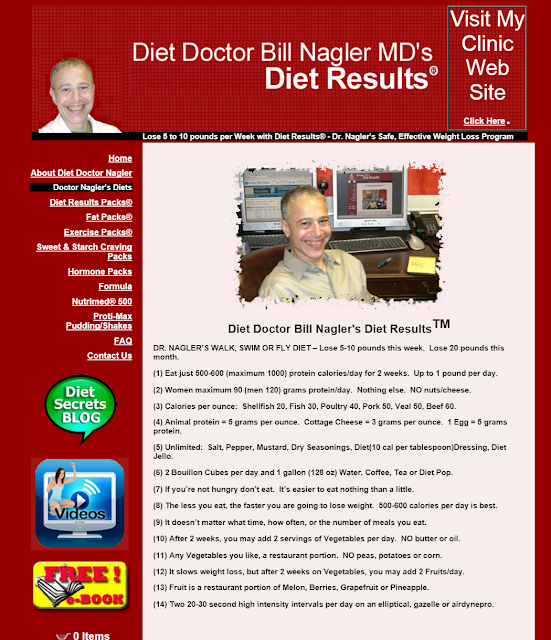 These men began as lean, healthy men, and were STARVED Mr. Taubes. It's truly repulsive to try to equate that with anyone's dieting experience. The men lost an average of a pound of body fat a week over the first 12 weeks, but averaged only a quarter-pound per week over the next 12, despite the continued deprivation. And this was not their only physiological reaction. Their extremities swelled; their hair fell out; wounds healed slowly. They felt continually cold; their metabolism slowed. More troubling were the psychological effects. The men became depressed, lethargic and irritable. They threw tantrums. They lost their libido. They thought obsessively about food, day and night. The Minnesota researchers called this “semi-starvation neurosis.” Four developed “character neurosis.” Two had breakdowns, one with “weeping, talk of suicide and threats of violence.” He was committed to the psychiatric ward. The “personality deterioration” of the other “culminated in two attempts at self-mutilation.” He nearly detached the tip of one finger and later chopped off three with an ax. When the period of imposed starvation ended, the subjects were allowed to “refeed.” At first they were allowed to eat more calories, but restricted as to how much. A subset under continued observation was then allowed to eat to satiety, which was surprisingly hard to achieve. The men consumed prodigious amounts of food, up to 10,000 calories a day. They regained weight and fat with remarkable rapidity. After 20 weeks of recovery, they averaged 50 percent more body fat than they had when it began — “post-starvation obesity,” the researchers called it. Implicit in many discussions of how best to lose weight is the assumption that hunger, which is a consequence of caloric deprivation, is not an issue. Health and government organizations tell the obese and overweight, who now make up just over two-thirds of our adult population, to do what the study’s subjects did: Eat less, cut back on calories.That advice implies that the ensuing hunger will be an easily bearable burden (no depression, lethargy, irritability — no tantrums, please!). And bearable not just for 24 weeks, but a lifetime. The Minnesota experiment tells us that when semi-starvation ends, the refeeding period will not end well. ENOUGH. Yes, many people experience hunger when they try to lose excess weight. 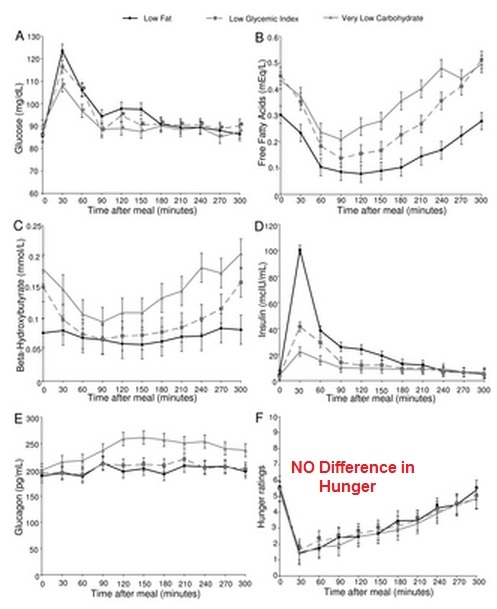 Many experience extreme hunger when they try to lose it with drastic cuts in intake, or when they get down to what is a normal weight but fail to acknowledge it. Or, say, when they are cutting for a body building or other physique competition. The MSE is legend in eating disorder literature, because it cuts through this notion that many of the behaviors of anorexia are the result of some underlying mental health issue ... rather there may be a point where the self-deprivation triggers these normal -- for the situation -- physiological responses. So then Gary goes off to discuss Hall's study. As if there is any relevance here. There isn't. 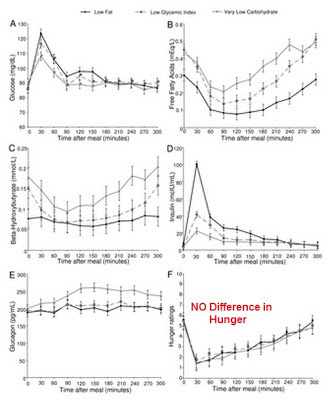 Firstly, Taubes appears to be working off of Eades mis-analysis of the diet in MSE. The low-fat diet of the N.I.H. experiment had significantly less fat (8 percent vs. 17 percent) and only 350 more calories a day than the diet on which the Minnesota researchers drove their conscientious objectors to the point of character neurosis and mental breakdowns. The N.I.H. diet had more protein, too. But the history of diet studies (and human populations) suggests that caloric deprivation is unsustainable. Questions like these about the relationship between calories, macronutrients and hunger have haunted nutrition and obesity research since the late 1940s. But rarely are they asked. Pure, unadulterated, steaming pile of bovine feces. Let us look at the upcoming Ludwig/Ebbeling led study that Taubes' not-for-business-but-plenty-of-personal-profit NuSI. Guess what? In the latest revision of the website, the study description has gotten rather chintzy. I have some quotes from the previous version on the website here. They're essentially pouring $14 million into this study wherein -- drumroll please -- the first step will be weight loss through "deprivation"
Imagine that. Oh they're going to repeat this hunger nonsense as well. Nevermind that the last time they did this, NO differences between the maintenance diets were seen. Discussed in this blog post, here are the plots. Eh ... what's a few more millions between friends. It would be humorous if it weren't so darned angering. Enough money wasted already, but Taubes is bound and determined to waste more for personal pride or whatever drives him these days. If people on low-carb diets eat less (the conventional explanation for any loss of fat that ensues), why aren’t they hungry? Where’s the semi-starvation neurosis? And if they don’t eat less, why do they lose weight? It implies a mechanism of weight loss other than caloric deprivation and suggests that the carbohydrates and fats consumed make a difference. Psychological boost of eating "forbidden foods"
What has also been seen, time and again in clinical trials with low carb diets (paleo versions as well) is that 6 months is the sweet spot. After that things stabilize to a new normal. In practice, it seems that folks hit the plateau anywhere from 6 months to a few years in. Having been told calories don't matter, or having convinced themselves, they are left to consume from an even more restricted list of foods as they are diagnosed with adrenal fatigue and other maladies, sold a bunch of expensive tests and supplements and developed a deadly fear of the carbs in spinach. And whatever happened to insulin? Slim-Fizz is a distinct appetite suppressant which is containing the ground-breaking fibre Glucomannan, which is an organic soluble fibre derived from pure Konjac.